It is absolutely NOT true that Jews were restricted from living in Kew Gardens prior to World War II. This is a rather incendiary charge to be made on what its editor intends to be a "feel good" site! In particular, it degrades the sacrifices made by those of the Jewish faith living in Kew Gardens at that time who served in our military during World War II. Some of them -- such as Donald Sussman, my piano teacher's older son -- made the "ultimate sacrifice". He was a bright, handsome young man, and had been a rugby player at Cornell before being drafted to serve in the Navy in World War II. I suggest the writer return to Kew Gardens and read the plaque erected near the former Homestead Hotel honoring other Jewish servicemen from that era. I think you have only to ask KG residents from the 30s and 40s to affirm the fact that there was little, if any, anti-semitism. In fact, the quite amazing thing about the community of my childhood was that so many different ethnic and religious people lived side by side and helped one another, especially during the Great Depression and war years. It is inaccurate -- not to mention disappointing -- to have someone suggest otherwise. The only ethnic group missing from the mix back them were African-Americans -- then called Negroes -- who mostly resided in nearby Jamaica. Nor during the time period cited was there any obvious Zionist movement among those generations of Kew Gardens residents. Among my high school Jewish acquaintances, I know of only one person who joined the Zionist movement, changed his name, and resided for a time in Israel -- and he came from Forest Hills! If, as the writer states, there is a large Israeli contingent dating back to Kew Gardens in the mid'50s and beyond, that's interesting to know. But his speculation about earlier times is false. I came to this site through the recommendation of Robert Lieberman who is making a movie on Kew Gardens. Having lived in Kew Gardens from 1954-1961 I found the site fascinating. It gives historical background as well as filling in the details of people who want to recall their childhood there. I attended PS 99 for one year only 1954-1955 in the sixth grade and Ms. De Azov was my teacher. I could not find any photos from my class. Afterwards I attended Russell Sage JHS and Forest Hills High School where I graduated in 1961. I went to Israel on the Young Judea Year Course and later made Aliya. I live in Jerusalem but still have contacts with some oldtimers.Some three years ago there was a re-union in Jerusalem of close to 50 ex-Kew Gardeners living in Israel. That is an indication of the Zionist atmosphere among the Jews who lived there. My generation were the children of refugees. Most of the parents had come from Germany and fled in time but there were others from Belgium, France (like my mother)as well as a group of Persian Jews. In that respect the demographic and sociological makeup of the Jewish community in Kew Gardens in the fifties was very different from that in other places.In addition, most of the families were traditional or Orthodox and had big families. 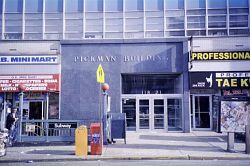 What I recall as a child growing up in the fifties were the delicious hand made chocolates of Mr. Stein or Mimi,the hardware store of Mr. Levine, the flower store on the corner of Lefferts and Austin St. and of course, the Austin movie house which had quality films. I thought the Homested Hotel on Austin St. was a landmark but now see that perhaps it was the Country Club of an earlier period. I recall that it was a hotbed of pro-Nazi meeetings. This I remember my parents mentioning.I also recall that Kew Gardens was "restricted" till World War II meaning no Jews could live there like Forest Hills Gardens was till much later. I would be glad to hear from anyone who remembers me from PS 99, Young Judea "Mac Donald's" club, or just round the neighborhood. We lived at 83-24 Abingdon Rd. 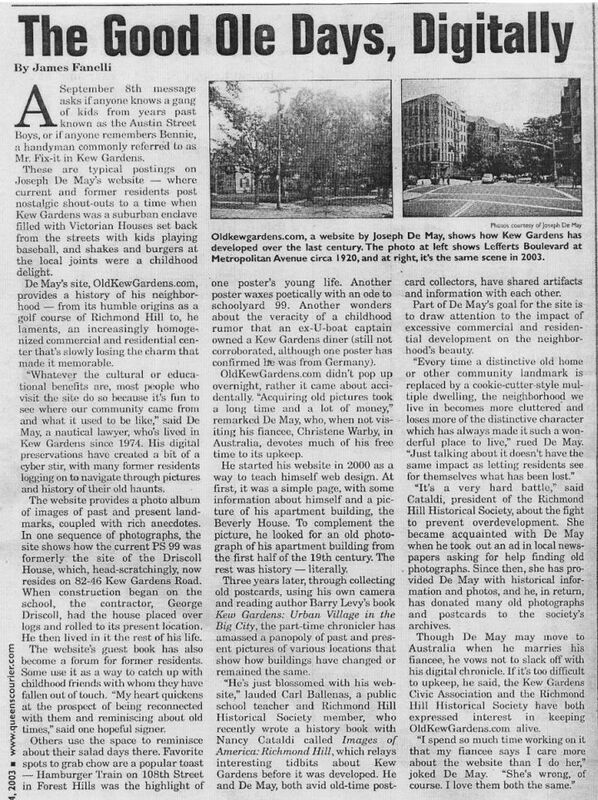 Editor's Note: Thanks to Peter Schiftan for the heads up on this Queens Chronicle article on the efforts being made to have Kew Gardens or part of it declared an historic district. The following link will open in a new window. Close out that window to return here. Queens detectives are seeking help from the public to piece together the circumstances leading to a Feb. 4 car shooting that left one man dead and a teenage boy clinging to life. Police believe that a passenger may have shot the driver and a teenage passenger in a Ford Explorer that crashed into parked cars on Myrtle Avenue near Freedom Drive in Richmond Hill at about 12:50 p.m.
Eyewitnesses told police a passenger in the Explorer ran from the scene and fled into Forest Park - moments before the SUV burst into flames. Firefighters who extinguished the blaze discovered the bodies and notified authorities, police said. A pair of joggers - both doctors - saw the tan Explorer burning and ran to help the driver and the teen, police said. The driver was pronounced dead at the scene, police said. The teen was taken to a local hospital, where he was listed in extremely critical condition. Anyone with information on the missing passenger is asked to call the CRIMESTOPPERS Hotline at 1-800-577-TIPS. I remember Pep McGuires - we were always too young to get in there. Always fascinated me as a young teenager. I may have gone there once or twice when I was oldeer = like 20 or so. It may have been a good hang out for all those airline types of people!!! Which I always wanted to be! Chalk it up to old age, I had restaurants mixed up - my brother didn't buy his house from the Pep McGuires guy, he bought it from the owner of a bar on Queens Blvd, I forget the exact name, it was on a corner across from the KG courthouse. I know the name ended in "Two" or "II" or "Too", it's on the website somewhere, can't find it. Editor's Note: It's taken me all day to remember this, but was the restaurant called The Part 2? I remember John Kearney in the mid-80s from when he used to deliver to my building at 83-43 118st. Always had a cigar in his mouth. Every time he'd see me he'd tell me how long he had till he could retire, I think he knew exactly how many days he had left. Then I went to work for UPS in 1986 and I found out why John was counting the days. It was hell on wheels. I was hired as a management trainee, which meant you delivered packages for 29 days, and then they moved you to management. That way they could stick to their "promote from within" policy. They were careful to not let the trainees deliver for 30 days, because then they'd be eligible to join the union instead. Anyway I started at the Queens South center in Richmond Hill where John was the shop steward. He was one of the funniest people I ever met and the best guy to have on your side if you were in the union. I've lived in St. Louis now for five years and I haven't met anyone with that kind of sense of humor. That kind of humor is one of the things I miss the most about New York, that and the beach. My name is Cheryl Cuddeback, I briefly lived in Kew Gardens during the mid 80's, when the Salty Dog was alive and kicking. I went to PS 101 instead of 99 because I'm basically from "The Gardens". I stumbled across this lovely site while researching Queens history for my web site: www.cherylc.com. 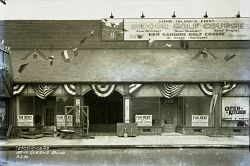 Even though my site is personal in nature, it incorporates a lot of history about Forest Hills Gardens and The Church in the Gardens. Your site is awesome. My goal is to emulate yours in content and information. My e-mail address may be published. If anyone wants to swap stories about the days of Crossroads Drug store or Peppie McQuires I'm all ears. For a close look at any location in the world, click here and download Google Earth. Editor's Note: In honor of Abraham Lincoln's birthday (February 12th), here's something you may not have seen before. I know I hadn't. Editor's Note: My computer problems are fixed and I am back online. Well, Joe - presume this is you. We have really started up some old memories here. Lisette DeBruyker wrote you because I sent her the link on KG. I too grew up there on 116th in Curzon Apartments. My name is Suzy De Maeyer Blanchard and my Mom is the lady she met in the park. Our family imigrated to KG from Belgium in 1949 - my Mom came later after I was born in Belgium at the end of 1950. My schooling was at Holy Child Jesus in Richmond Hill and high school in Brooklyn, St. Angela Hall Academy and then business school in NYC. My brother was also born in KG at Kew Gardens Hospital. We at first lived with my grandparents till I was about 8 and then moved upstairs to our own apartment. KG was a wonderful place to grow up. Having the park so nearby - it was our playground - all of it. Great sleigh riding on the old sleighs of course, down the big hill on Park Lane South. As we got braver, we ventured a little more down toward Myrtle Avenue where there was a big gully - you could slide down one side and nearly up the other! Many a day of playing cowboys and indians with my brother and our friends - no problems with safety issues back then when we ventured to what we thought was "deep in the woods". There were even edible berries which my grandfather taught us was safe to eat. When we could afford it, we went horseback riding through the park. The stables were on Union Turnpike off Metropolitan Avenue. Imagine that! It was a wonderful neighborhood, very diverse in cultures and we all got along. I too remember the Homestead - had the closet things to Belgium that our family loved, the fish and meat market on Metropolitan Ave and Lefferts (two separate stores) I remember well. In later years, my hand out was the Salty Dog which is now the site of a large apartment building - too bad. On the corner of Metro and 116th Street was a corner candy store - great place, spent many of my pennnies there - and had lots of egg creams - which I think only New Yorkers really know what they are. I think it is a coffee shop now and they have removed the great old ice cream counter they used to have. The cleaners, drug store and Associated I think are still there too. My best friend Diane, grew up on 124th and Metro. We went to the same grammar school together. Later she moved to Forest Hills just on the fringe line of KG not far from Forest Park. We recall one heavy snowstorm, had no school - we gathered our skiis and skied around the neighborhood to 83rd or 85th road - can't remember exact - it's the long one from Metro Ave all the way to Lefferts Blvd. We skiied down that hill several times to Lefferts Blvd. We also frequented Danny's pizza parlor which stood on the corner of that hill on Lefferts. He would let us hang out if we filled up salt and pepper shakers and cleaned tables with an occasional slice of pizza thrown in. We also spent some time in the old Hofbrau House - carved our initials in the wooden booths too!! Guess we were typical devils back then! My parents just moved from Curzon Apt. -- after spending nearly 55 years there - to FL. So, we are all going back down memory lane here. Park Lane South had (hope they still do) beautiful crab apple trees which were abundantly blooming in the Spring - they were fantastic. I believe near Curzon Road and Park Lane. There was also a large, setback home on Park Lane - I always thought it was a castle! Well, I better be going now. I'm sure you will received many more of these emails as word get around. Glad you have started this. We'll check in from time to time. I've just about spent an entire morning checking out Kew Gardens! What a pleasure! The daughter of an old friend of mine just emailed me your site! Kew Gardens was my first home as a newlywed....in 1950! We were married in 11/50 and had moved to Nutley, N.J. My Mother became ill ... she and my Dad lived in Kent Manor at the time...a beautiful place....we needed to be closer to both of them....my Dad was the "painter"( in apartments, not regular paintings) in Kent Manor from about 1950 till my Mom passed away, he continued to live there till he remarried and moved to Belgium in 1960! He was well known by all the residents....the Belgian singer/painter they called him...perhaps there are a few "kids" my age who still remember him! Anyway, apartments were very scarce in the '50's....so my Dad, who had worked for the owners of Kent Manor (Jacob Cohen, Louis Cohen, his son, and Julie, I believe, Cohen) ..and of course, the then superintendent/manager...David Wager..were all good friends....and we got an apartment....in "C" bldg overlooking the park! I thought I had died and gone to Heaven! It was a small bedroom apt....with a big entry way that served as a dining room and we loved it! We stayed in that apt till our 2d son was born and then moved to a 2 bedroom apt in "D" bldg ...overlooking Metropolitan Ave...which my boys loved....the "garbage" truck came by and that was their great ambition to drive a garbage truck!